There’s plenty of saturation in the communication app market these days, but over-the-top messaging company Tango is doing one more thing to set its app apart. 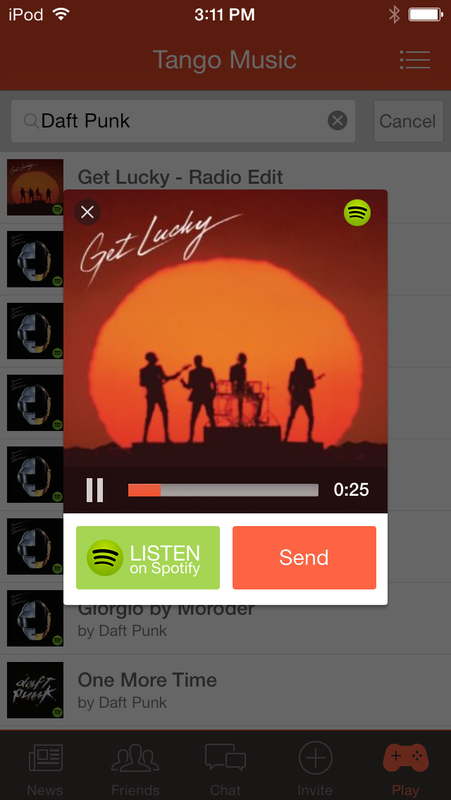 After raising nearly $40 million in a Series C in 2012 and launching a gaming communications partnership earlier this summer, the company announced that it is now turning towards music by offering 30-second clips of music in its app, in a deal with Spotify. The new feature will allow Tango users to access Spotify’s 20-million strong library, including Spotify exclusives and in-house sessions. The clips appear roughly the same size as an average sticker, but when clicked open a larger, card-like graphic that shows off a graphic related to the song’s album or single. The feature will roll out to Tango’s user base, which now sits at nearly 100 million monthly active members, across all of its platforms, according to Eric Setton. It’s clear that Setton and the rest of the company are focused on differentiation in an environment where every communications app is converging on the same handful of features. Setton said that music is a logical step for Tango: He hopes that both serious music buffs and casual listeners utilize the feature as another way of expressing themselves beyond the app’s ample emoticons, stickers and video capabilities. But adopting music is just another sign that Tango (and apps that compete with it) is looking to bring other mobile features right within the app. With video, gaming and now music all in one place, Setton admitted that the goal is to keep its users focused on Tango.